A clutch is an interconnection between the drive motor and the spin tube on most top load direct-drive washing machines. It is a mechanism that absorbs rotational energy from the motor and gradually transfers the energy to the spin tube. It is an integral part of most direct drive washing machines. Without it, the motor would spin the inner basket quickly with no regard for the weight and/or water in the inner basket at the time. We would not want the washer to spin at top speed if the basket is still filled with water – there would be a flooded laundry room. When the drive motor engages, it turns the outer part of the clutch at a high rpm. The inner part of the clutch, which is connected to the spin tube, is not turning as fast. The clutch spring is initially compressed, thus lessening the friction between the inner and outer linings. As the inner part of the clutch gains speed, the spring expands, increasing friction on the clutch linings, and causing the spin tube to gain more speed. Soon both inner and outer parts of clutch are spinning in sync. Contamination of the clutch linings due to leaking transmission. When this happens, the friction between the linings will decrease and the washer spin tube will have problems reaching the full spin speed. Worn clutch linings – In home laundry usage, washer clutch linings degrade frequently. A lid switch is a washer’s safety mechanism to stop personal injury during the spin cycle. When the washing machine is spinning at a high rpm, there should be no arms or hands that could get caught inside. There should be no little kids falling into the tub. 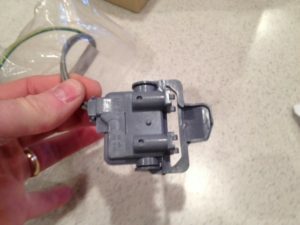 The lid switch prevents such occurrences by shutting down the drive motor when the lid is lifted. 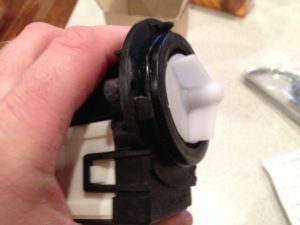 The washer lid switch is activated by an actuator located in the inner surface of the lid. With all washing machines there is moisture. Moisture is very corrosive to metal parts over a long period of time. The small metal plates of the lid switch start to develop corrosion and mineral deposits which frequently cause them to fail. This is one of many components that can fail and cause the “no spin” condition. This can be easily tested by removing the console and testing it at the timer connector. You will need a multimeter to test this. Push downward on the lid switch with a screwdriver and look for a “short” reading on the meter. Replace the switch if in doubt. Objects and clothing can get wedged under the inner tub of the washer. The clutch will slip excessively due to the drag, caused by wedged object and the washer will never reach the desired spin speed. 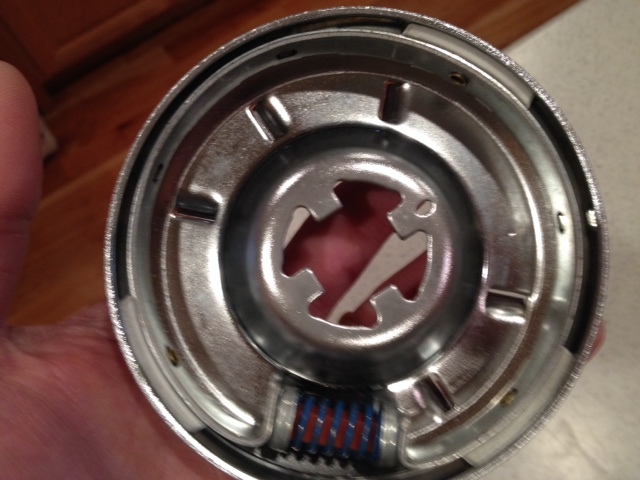 The washer enclosure and top inner basket should be removed for inspection. You will need a special spanner wrench to remove the basket. Inspect and remove any debris or objects from the outer tub. There is a gap between the inner and outer tubs of most washers. Frequently a sock or object falls into this gap and the water can flush it into the drain- pump during the drain/spin cycle. A frequent symptom of this condition is a non-rotating motor or humming sound. The inner basket will not rotate at all. To remedy this problem the pump will have to be replaced, in most cases. The wedged clothing usually causes damage to the inner part of the pump and it will eventually leak water. The pump is usually piggy-backed on the drive motor. The enclosure will have to be removed to gain access. A drain pump’s function is to drain all the water out of the inner tube so the washer can go into a high-speed spin. If the drain pump does not function properly, the washer will not spin at the proper speed. Most pumps are electric stand-alone type or a piggy-backed mechanical design. Front-Load washer door latches prevent the door from opening during high speed spin, thus preventing injury. The main electronic control board, on most models, uses a latch sensor to detect the closed latch condition. If it does not sense the closed condition most washers will give some type of error code on the display. A common error code is “DL”, indicating “door lock”. Other washers will not give an error message but will sit still in a “paused” state. It is not easy to diagnose a bad door latch and it’s impractical in many cases to test the latch with a meter. Swapping in a new latch is the most common procedure for isolating this problem. 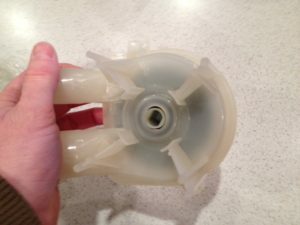 Newer drain pumps have a plastic impeller that is easily damaged. When this impeller is damaged, it sometimes rattles around instead of pumping water. Many times the problem is intermittent. When you have a slow drain condition and you have removed all obstructions then the drain pump should be replaced. A high speed spin condition cannot be achieved without all of the water being removed from the tub. When non-HE soap is used in Front-Load machines excessive suds can occur. The suds will not liquefy fast enough to be drained out of the washer. The control board and sensors will detect the slow-liquefying suds and go into a routine to purge the slowly dripping water. In most cases, the suds routine will not be sufficient to compensate for the suds and an error message or “no spin” condition will occur. 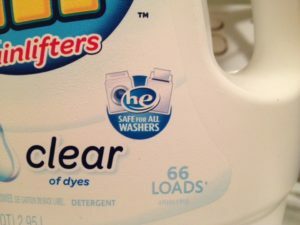 HE detergent should always be used on Front Load washing machines. It’s been a tough Boise winter!